Why paint every Viking shield when you can just add a Little Big Men Studios transfer?! 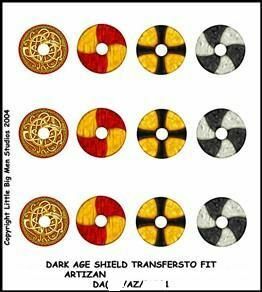 These full colour shield transfers are designed to fit onto our 28mm Viking shields. You get 12 to a sheet. There are lots of different designs, we have chosen to illustrate just one of them, so you may not receive the same sheet as the one pictured. If you specifically want a certain design or sheet, please email us.